Spray 4- to 5-quart slow cooker with cooking spray. In 12-inch skillet, heat oil over medium heat. Add mushrooms, onions and garlic; cook 4 to 5 minutes, stirring occasionally, until onions are tender and translucent. Spoon vegetables into cooker. Stir in remaining ingredients. 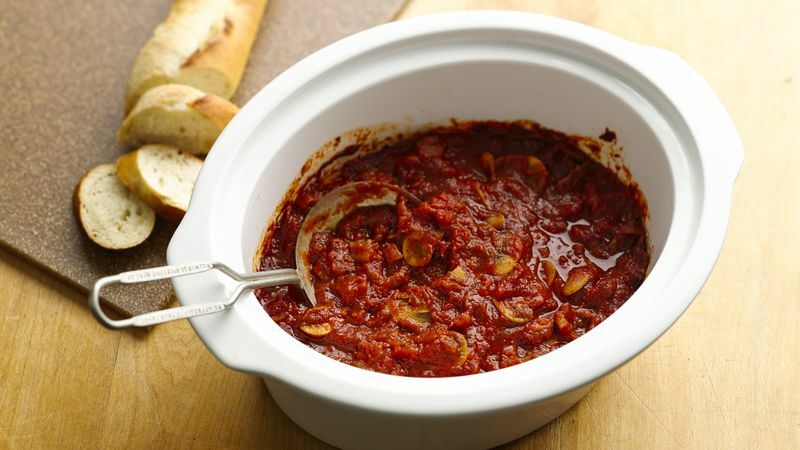 Ladle this versatile sauce into refrigerator or freezer containers; cover and refrigerate up to 4 days or freeze up to 4 months. To thaw frozen spaghetti sauce, place container in refrigerator for about 8 hours. Use 3 to 3 1/2 cups of this homemade sauce for recipes that call for a 24- to 27-ounce jar of tomato pasta sauce. Spaghetti Sauce with Meat: Stir 1 pound cooked lean ground beef into 3 cups of Slow Cooker Spaghetti Sauce. Spaghetti Sauce with Meatballs: Add cooked meatballs from Easy Meatballs recipe to spaghetti sauce during the last 15 minutes of cooking time to heat thoroughly.